To be effective in conserving the rich diversity of wildlife that inhabits The Bourne, we need to know what occurs where, and also to be aware of the changes, some good others bad, that are taking place. Thus wildlife surveys and recording underpin most of what we are seeking to achieve. In addition, the results help us to demonstrate the effectiveness of our activities which is necessary if we are to be successful in any bids for future funding. In the past our wildlife surveys made important contributions to our gaining funding for the Middle Bourne Community Garden and Old Churchyard projects. We are experiencing unprecedented changes in our environment for reasons that are both global and local in origin. The global category includes climate changes resulting from the burning of fossil fuels (see effects of climate change in The Bourne) , and the impact of the use of massive quantities of chemical fertilizers to support intensive agriculture needed to feed the burgeoning world population, and the popularity of gardening. More local pressures are building up through increased house building and infilling. These threaten to fragment the semi-rural character of our neighbourhood, and disrupt the effectiveness of The Bourne as a green corridor between the neighbouring wildlife reserves, which are of national and international importance. Many of our members contribute to national surveys like the Big Garden Bird Watch or the British Trust for Ornithology’s on-going survey. 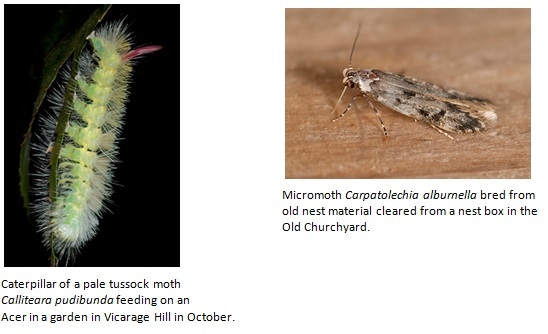 Last year the BCG contributed to the National Moth Day, by running a light trap in the Old Churchyard. Year by year we have also conducted local surveys as below. This was our first survey in which we searched in vain for the remnants of the colony of Great Green Bush Crickets that once inhabited the Bourne Valley along Sturt Walk. The habitat of these sun-loving, charismatic and noisy relatives of grasshoppers was already under pressure from the increase in tree cover along the valley, but we think it was a drainage scheme carried out in the valley that finally destroyed the viability of the colony. As part of a Pilot Scheme aimed at introducing a wildlife warden into every parish in the county, BCG undertook general surveys of birds and mammals throughout The Bourne area. 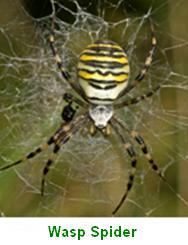 This was very useful in compiling data which was written up in a full report by the Surrey Wildlife Trust. It also enabled our own members to get to know the area better and to make contact with about 50 residents who took part in the surveys. The scheme never got any further but it did indirectly lead to the formation of the Surrey Hills Society of which BCG is an associate member. We paid special attention to recording the wildlife of the Community Garden in Middle Bourne Lane. The impressive result was just how many species appeared in the garden as a result of our digging the pond, for example five species of dragonfly and damselfly bred there, in addition to water boatmen, caddis- and hover-flies, frogs and newts. In the autumn the ivy flowers attracted a rich variety of hoverflies, wasps, hornets and several day flying moths. Our records were boosted by Surrey Wildlife Trust holding a wildlife evening in the garden when, for example, the placing of a number of carpet tiles around the garden revealed unexpectedly high numbers of slow worms – one tile had five underneath it. 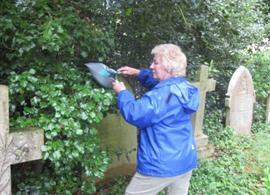 The main focus of our attention switched to surveying the Old Churchyard, again with impressive results. Helped by an identification training day run in conjunction with the Surrey Wildlife Trust, we have recorded 43 flowering plants, and 8 non-flowering plants, 12 birds, 4 mammals, 3 amphibians and reptiles, 18 slugs and snails, 10 butterflies, 118 moths, 42 other insects, and 19 other invertebrates ? and we are yet to dig a pond!. At the start of 2010 we decided to assist the Woodland Trust with its national survey of ancient trees. We already knew that there are 5 areas of ancient woodland in The Bourne area (where trees are known to have existed since at least 1600) but no details are documented. The process involves identifying large trees, locating them accurately (preferably using GPS), measuring their girth (which gives a good indication of age), photographing them and recording the data with the Woodland Trust. A good start has been made but it is hoped to get more input from members and residents so as to compile a more comprehensive picture. 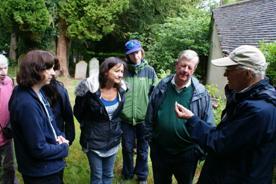 In June 2011 we once again held a Survey and Training Day in the Old Churchyard, the third in succession. 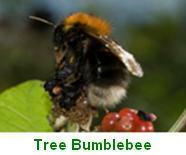 This was in conjunction with the Greenspace Team of Surrey Wildlife Trust. Notwithstanding the heavy showers experienced, the participants enjoyed a useful, instructive and fun day. Generally, relatively few animals were collected reflecting the previous dryness of the season, but one mat had over 50 of three species of woodlice under it, and under others were a slow worm and a hedgehog slug. After the lunchtime storm had cleared, some of the privet and laurel hedges were surveyed using a method suggested by iSpot (www.ispot.org.uk). These surveys involved using a dust pan and brush to collect animals from the hedge. It proved to be more of a training exercise than a rich source of animals as the earlier torrential rain had beaten the insects from the vegetation; even so a few things of interest were found. The participants went away with a folder full of useful information and a CD containing identification guides, pictures, codes of practise and forms for recording animals seen. At The Bourne Show in July 2011 we launched a scheme to try to increase the number of wildlife sightings that we record. 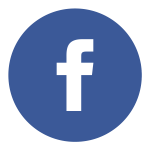 We feel there is a need to do this so as to improve the knowledge of the area where we live, improve the records held on the Surrey database and to help us respond accurately to planning applications which are likely to adversely affect the local environment. This is a long term project so we are asking members and others to keep up the reporting over a sustained period. The season for moth trapping is nearly over for the year, but even in December there are some moths about when the weather is relatively mild. Male winter moths fly even on cold nights (I caught one on 4th December), but the females are wingless. Their caterpillars hatch as the new leaves burst in the spring and are an important food resource for adult birds to feed their nestlings. The first moth I found this year, however, was one that hatched from nest material cleaned out of the bird boxes in the Old Churchyard. 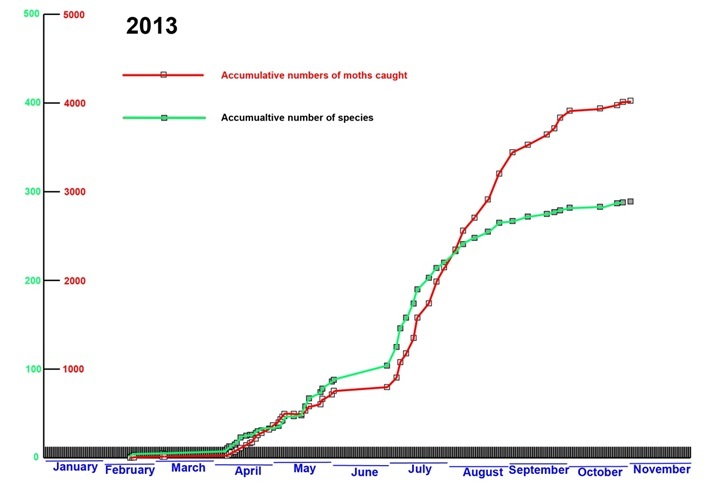 I have plotted graphs of the accumulative totals of specimens (in red) and species (in green) throughout the year. 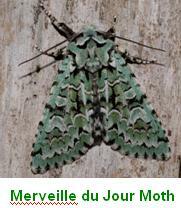 They show how because of the cold spring moths numbers and species were unusually low around until April. May is always a dull time and the graphs show that I was away in June. Then numbers soared during the warm weather in July and August. Although the largest numbers of specimens were caught were in September, the numbers of species were beginning to decline. Throughout the year, I have trapped 4060 moths belonging to 290 species during 59 trapping sessions. The figures for previous years were respectively ? for 2010 ? 2671 specimens and 269 species; for 2011 – 2933 specimens and 289 species; and for 2012 – 2106 specimens and 296 species. So despite the cold start 2013 has been a better year for moths than the previous three years. However, the Surrey moth recorder Graham Collins tells me that 20 years ago the numbers of moths caught would have been closer to 20,000! 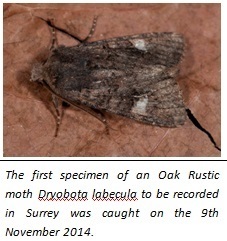 Unlike previous years there were no rare moths caught ? 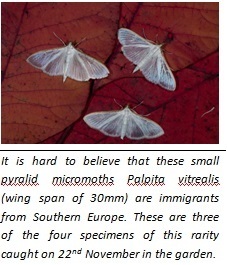 the most interesting species was a specimen of Palpita vitrealis a small white moth that is a immigrant species that usually only occurs near the south coast. My favourite moth picture for the year was not one of an adult but of a caterpillar. I found this psychedelic caterpillar of a pale tussock Calliteara pudibunda one night in October eating one of our Acers. 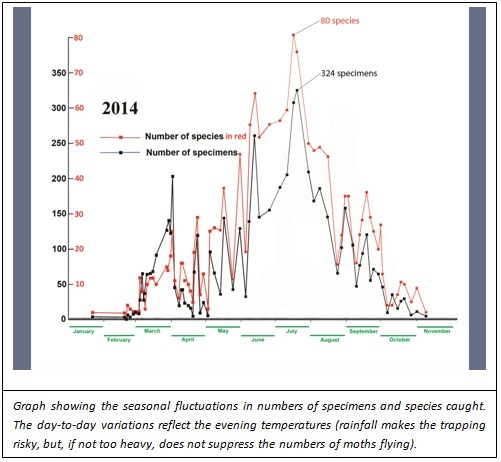 Profiles of the accumulative numbers of moths and of species caught though the year, showing how few were caught during the cold spring, but increased substantially in the summer. 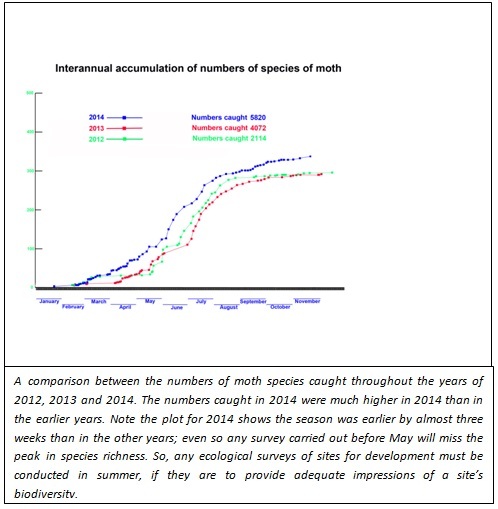 Note how the numbers caught increased substantially well after the numbers of new species caught each night began to decline. Compared with the previous two years 2014 was a remarkable year, probably because generally the weather was better. I was able to trap on 75 nights in the garden catching 5808 specimens belonging to 336 species. Graph showing the statistics are at the end of this section. Comparing catches it was evident that the season for moths was about three weeks earlier that in either 2012 or 2013 when the springtime temperatures remained cold well into April. I also trapped on a couple of nights in Sturt Walk to provide base line data for assessing how effective the scout project is being in improving the biodiversity along the valley – following after the remedial work carried out by the Department of Environment after the landslip that occurred at Christmas 2013. I also trapped on two nights in the Middle Bourne Lane Garden to provide some ?entertainment? for the Farnham-in-Bloom judges. I helped with five nights of moth trapping on Royal Common near Elstead where the species composition of the catches was significantly different. Monitoring in Compton Field was also on-going, in order to gather compelling evidence that the building of 180 houses there will be an environmental catastrophe. While I was not able to run the light trap, I went out at night and photographed the moths nectaring on the ragwort, recording 51 species! Ragwort is generally loathed by horse lovers because if it gets incorporated into hay it fatally poisons the horses (and cattle). Ragwort, while it is growing is distasteful to the stock and does not get grazed. This raises questions about how best to manage ragwort, especially as it is so very important in maintaining biodiversity ? several species that are nationally vulnerable are totally dependent on ragwort . With the help of the Surrey recorders, we have now recorded over 650 species of animals and plants in the Compton fields, surely a richness that deserves protection. The records also demonstrated that any ecological assessments required of developers before their plans developments are approved, should be carried out during summer, rather than late or early in the year when the full richness of the diversity is not evident. Amongst the highlights for the year were the first ever record of an oak rustic in Surrey (9th November), the capture of four specimens of Palpita vitrealis on a single night (? 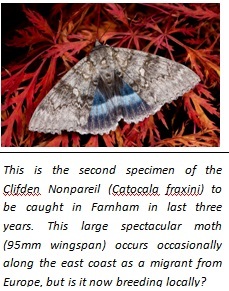 this is more specimens of this rare migrant species that the Surrey moth recorder has seen in his lifetime), the second record of the spectacular Clifden Nonpareil moth in Farnham (so is it now breeding locally? ); my first record of an Emperor moth in the garden and the capture (and release) to two male stag beetles on 8th June. The peak night for moths was the warm night of 17th July when the temperature was still 19?C at midnight; I was overwhelmed by catching more than 308 moths. 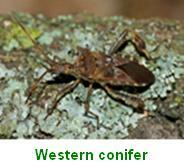 As evidence of the changing pattern of wildlife, over the past three years we have witnessed a mass immigration of Painted lady butterflies, and the arrival in our area of the harlequin ladybird, the wasp spider, the tree bumblebee (Bombus hypnorum) and most recently the western conifer seedbug Leptoglossus occidentalis. The last two species have only arrived in Britain within the last decade. All our wildlife records are archived with the Surrey Recording scheme. A bioblitz, which involves a survey conducted over 24 hours of all the animals and plants in an area, is proving an effective way of gaining a good over-view of the biodiversity of sites in a short period. Our Group therefore participated in the National Garden Bioblitz in 2015 by carrying out a bioblitz survey in the Middle Bourne Lane Community Wildlife Garden over the weekend 29th -31st May. Unfortunately the weather all over the weekend was damp and chilly but, although this undoubtedly affected the species counts, the aim of obtaining a general picture of the Garden was achieved. As a prelude Lisa Malcolm conducted a Bat Walk on the Friday evening. This was followed at 2100 hours by light trapping for moths conducted by Martin Angel and Paddy Lewin with the chairman in attendance. This was against the background earlier in the year of air temperatures falling quickly after sunset so that numbers of moths flying had been lower than expected. On this occasion There was total cloud cover so the air temperature did not drop quite so sharply and moths started to arrive at 2200 hours. They increased in abundance after 2300 hours and the light was finally extinguished at 0030 ours when the increasingly heavy rain had reduced the numbers of moths flying. At 0900 hours the next morning, with the rain still falling, the catch revealed 72 specimens of moths belonging to 35 species. The dominant species was treble lines (25) followed by heart and dart (8). For 2015 this was a good result but numbers were rather less than expected from previous years. Throughout the rest of the day there was a succession of activities collecting and identifying all the species we could find. Paddy, for example, kept a running tally of the birds visiting the garden. In the morning Hilary Dickson and Isobel Girvan of Surrey Wildlife Trust braved the rain and carried out a botanical survey, remarkably finding 169 species of plant ? a mixture of naturally occurring and planted species. At night the pond was attended by at least eight frogs, and pond dipping by day confirmed it was also seething with smooth and palmate newts, but disappointingly little else; probably because it had been refurbished during the winter. There were, however, many mature dragonfly larvae and predacious water boatmen, which may also have accounted for the lack of other species. For insects and other invertebrates, the survey used the contents of pitfall traps, looked under the mats, and gently used sweep nets on the nettles, brambles and the hedge. There were the usual suspects, but fewer than expected because of the persistent rain ? for example not a single hoverfly and there were very few bumblebees buzzing around. By the end of the day, the Group had identified 83 species of animal – 15 birds, 5 molluscs (slugs and snails), 19 insects, in addition to the 35 moths, and 5 other invertebrates (woodlice, millipedes and centipedes). If the weather had been better this number may have easily doubled. Even so BCG is now so much better informed about the biodiversity of the garden and its surrounding area. It was also good to be able to contribute to this national initiative.